Photo from George Kane. 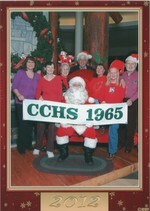 CCHS Class of 65 with Santa. Part of our CCHS class went to the Newburgh Mall today and had a photo shoot with Santa. The Cornwall High School Class of 1965 would like to wish everyone a safe and happy Christmas season. May peace, friendship and joy come your way every day of the coming new year.